Everyone has heard the adage that breakfast is the most important meal of the day. But with the frenzy of the morning schedule and all the hurrying around to get to work or school, the day’s first meal often suffers. In an ideal world, we’d all have time to cook a healthy dish every morning: eggs and sautéed greens; oatmeal with nuts and fruit; or whole-wheat waffles. But in reality, we often only have enough time to scarf down something quick or grab food on the way out the door to eat in our cars or desks. Which is why fast foods like cereals, pastries, snack bars and donuts are popular. As convenient as those foods are, however, they are often laden with processed sugars or empty carbs, and don’t make a good base for sustaining a human body through the day. We need a balanced mix of protein, fiber, whole grains and fruits and vegetables to carry us through. The good news is that making healthy breakfast doesn’t have to be a time-consuming daily chore. There are lots of shortcuts to ensure you can get healthy food on the menu all week long. It just takes a little planning and some bulk preparation. One idea for easy bulk breakfasts is overnight soaked oats. I like to mix ½ cup of oatmeal, a tablespoon of chia seeds and frozen berries in a mason jar, and soak the mixture in about a cup and a half of nut milk. Let it sit overnight, and it’s ready the following morning. Topped with toasted nuts, it makes a filling breakfast. By preparing several mason jars at a time, you take care of breakfast for the whole week. Another option is baking loaves of nutritious quick breads. These can be packed with ingredients like nuts, quinoa, coconut, dried fruit or even carrots and zucchini, and also make as easy to-go breakfasts that are good for days. Or for people with more substantial morning appetites, another breakfast strategy is to make a large batch of breakfast burritos, wrapping the extras in tin foil and storing them in the freezer until it’s time to eat. Sweet potatoes, black beans, corn and scrambled eggs make tasty fillings. My current favorite, however, is homemade granola, which I eat almost daily with yogurt and fruit. Store-bought granola is often expensive and filled with sugar; cereal meanwhile is usually unsubstantial. Making granola at home saves money, helps ensure the ingredients are good for you and limits sugar. My go-to recipe is based on one from my aunt Linda. It’s healthy, low-sugar and adaptable. Sometimes I add more cardamom or cinnamon; other times I include coconut; and I alternate between almonds, walnuts and pecans, making every batch a little different. The best part is, every time I make it, my house fills with delicious smells of toasted grains, warming cinnamon and thick molasses. This recipe makes about eight cups, which lasts my household a little over two weeks. Preheat oven to 300 degrees and oil a 13×9 inch casserole pan. Add oats, nuts, seeds, flax seeds and spices, and stir well. Bake for 45 minutes, stirring once, until toasted. Combing oil, molasses, honey and vanilla in bowl and whisk until well incorporated. 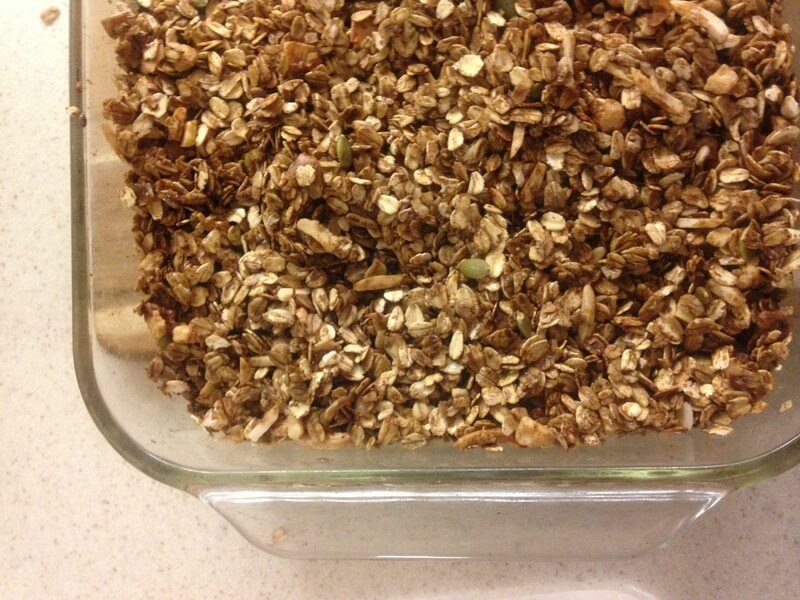 Pour this mixture over dry ingredients and stir until it’s evenly spread into granola mixture. Bake another 30 minutes at 300. Let cool for 10 minutes, then stir to ensure granola doesn’t clump together. Serve with yogurt or milk and fruit.